Click here to visit the publisher’s website where you can see a video of Forrest talking about the book and find out how to get your own copy! Thing two – Forrest is supporting the On Pasture Fall Fund Drive by giving away copies of his book to folks who support On Pasture at the $50 or higher level! Woo Hoo! It’s a hard back book, full of beautiful pictures and recipes. It will make a great gift for your favorite person. So head over here to get your copy and support in On Pasture. “Whoo-oop! Whoooo-oop!” The farmer cradles a hand against his cheek, his voice echoing across a misty West Virginia meadow. The sound is a cross between battle cry and invitation, a melodious call to arms—or in this case, a call to hams. In unison, forty barrel-shaped durocs raise their heads, abandoning a morning of glorious, muddy rooting to heed the clarion. Bounding and snorting, just short of a stampede, they gallop into a fresh pasture of millet, their rust-colored backs disappearing beneath the waving green forage. Moments later they’ve vanished entirely, abandoned in breakfast. My mind wanders, and I imagine pigs in a pumpkin patch, munching their way into gourds that accidentally become stuck on their heads. Jacko’- lanterned hogs squealing blindly through the pasture? That would be a Halloween shindig of epic proportions. Chuck, on the other hand, is all business. He strides across the field, reconnecting the electric polywire through which the hogs have just passed. It rained hard the night before, and the paddock looks like hand-mixed brownie dough—lumpy, moist, and rich. More accurately, I realize, the soil resembles a freshly tilled garden, its cover crop of field peas harvested and the residue turned beneath the ground as fertilizer. Forty sturdy snouts, it seems, can do the work of one man with a plow. While some farmers might bicker over the efficiency of free-ranging pigs, I’d argue that you can’t eat a tractor. Besides, where’s the fun in life without trying new things? Experimentation, in fact, is part of the mission at Black Oak Holler. 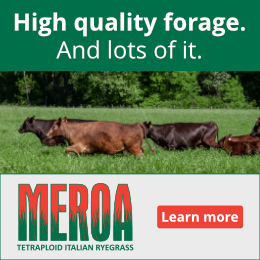 Just minutes from West Virginia’s state capital and a morning’s drive to Cincinnati, Pittsburgh, Lexington, or Charlotte, the farm is ideally located to serve metropolitan areas. That is, if pure production was all that mattered. 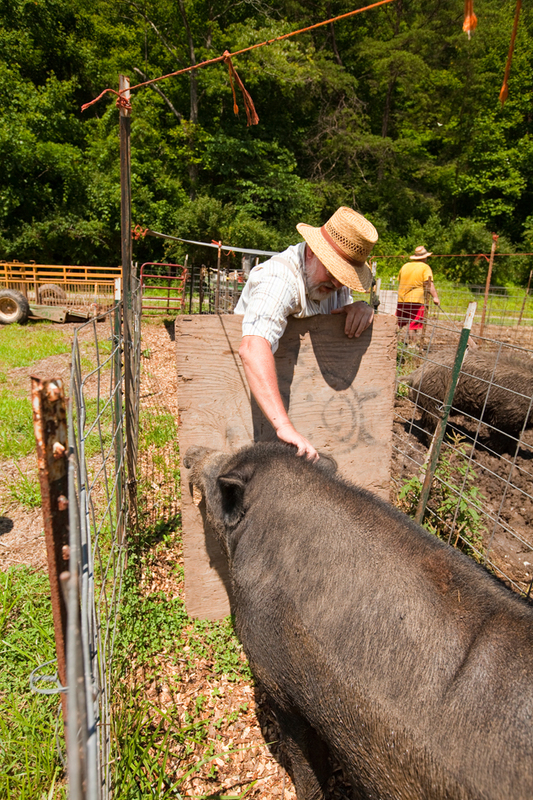 But Chuck began farming with a firm goal: create a sustainable system for raising pigs on the Allegheny Plateau, fattening them—as is traditionally done in Spain—on acorns, walnuts, and hickories, and make it replicable so others could copy his methods. In a region most famously noted for logging and coal mining, he wanted to prove that fragile mountain soils could be restored, even enhanced, through carefully managed livestock. No easy task in this land of rolling hills, where farmers jokingly grumble they occasionally fall straight out of their cornfields. A former professor at North Carolina A&T State University, the desire to teach seems to come naturally to Talbott. 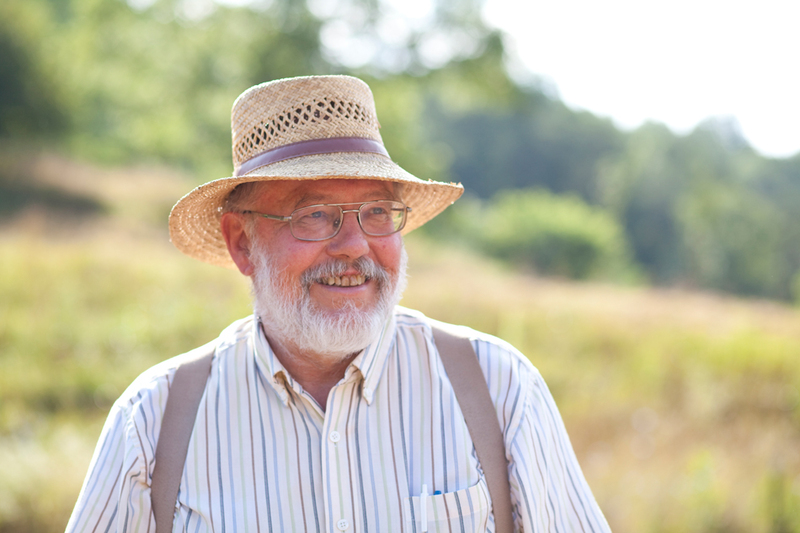 He founded the university’s sustainable swine program in 1994, spending the next ten years researching everything from the breeding of piglets to the curing of hams. But the farmer readily admits he’d rather be working the land than grading papers in an office, one of the main reasons he found solace in this isolated corner of the state. “Why would anyone want to wear a suit and tie?” he asks, garbed in a straw hat and suspenders. 270 acres is textbook Appalachia, mountains meeting at precipitous angles, ephemeral springs trickling water clear as moonshine from the gray, lichened stones. 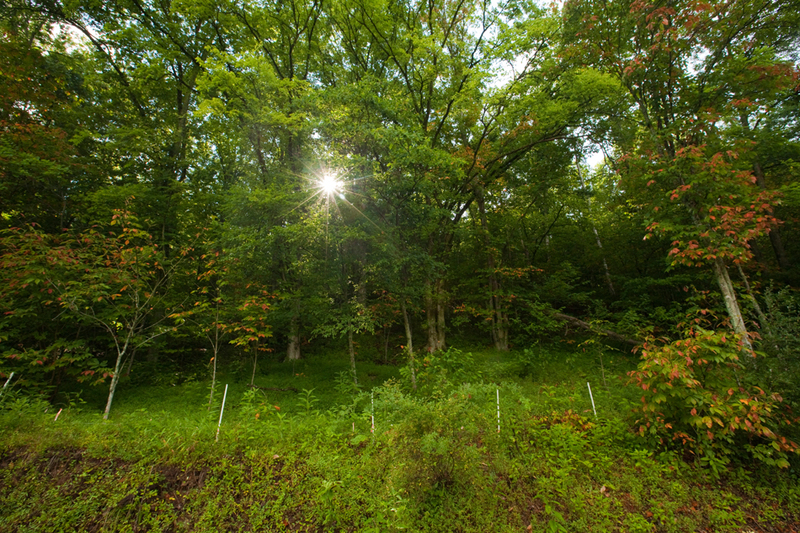 Once towering as high as the Alps and the Rockies, the Appalachians are among the oldest mountains on earth, now weathered nearly to their roots. The ancient orogeny still echoes through this wild hollow, with a cobbled, single-lane road the solitary access to the valley’s head. Chuck seems at home with the wildness, the wilderness. In fact, he’s spent a lifetime acclimating himself to the challenges, gaining experience through decades of world travel. So how does a world traveler end up in the mountains of West Virginia? Evidently, by possessing a farmer’s intuition. In 1978, a side trip to visit his sister in nearby Huntington led him to an old tobacco farm, wild and wonderful and with jaw-droppingly cheap acreage compared to anywhere else he’d been. 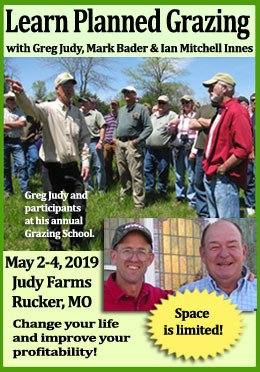 Knowing that he was only passing through, and not even certain about what he’d do with the land, Chuck pulled the trigger and bought himself a farm. It would be twenty-five years before he officially returned. 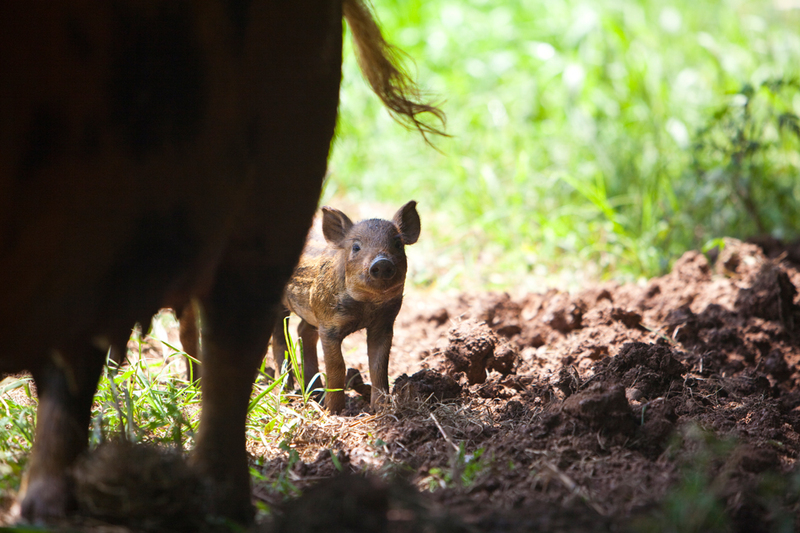 The farmer nods at the boars, bristle-backed with bright white tusks protruding from their lower lips. Why breed wild boars to domesticated stock? To pass along desirable attributes, the professor explains. 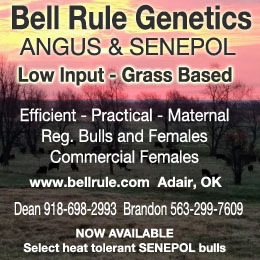 Wild genetics add natural vigor that can’t be found in commercial hogs, pigs specifically bred to live out their days in concrete feedlots. 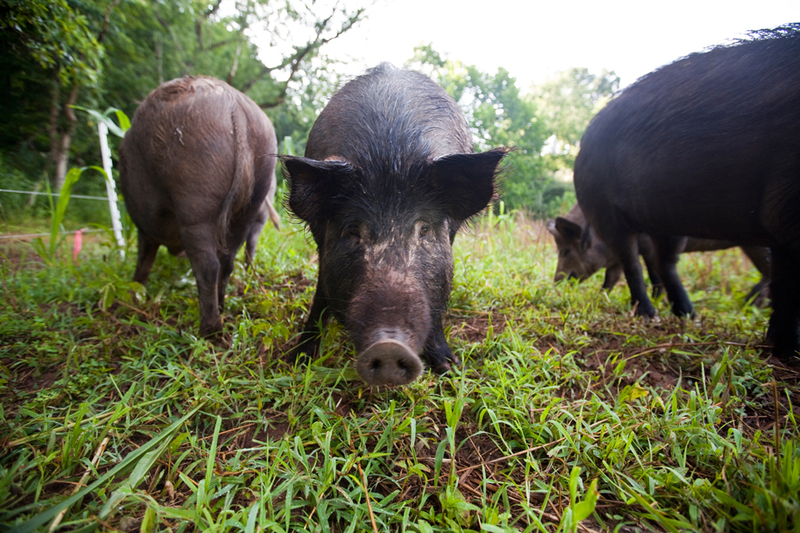 The concept makes sense; if you’re going to successfully breed hogs in a wild holler, I reason, then you’d better stack the genetic deck, placing the odds in your favor. And that’s precisely Chuck’s goal: to raise hogs that thrive on the mountain slopes, naturally fattening on acorns. In a state where mining is the primary economic engine, the farmer is banking on a loftier commodity, one that drops straight out of the sky. “That’s the whole goal here,” he explains, “matching the hogs to the terrain, like they’ve done for centuries in Spain. Pigs have an uncanny ability to find acorns, and in abundant years, the mast falls like rain.” Chuck gestures toward the hills, where the tree canopy is so dense it nearly blocks out the sky. Released into the woods at just the right time, the pigs will fatten on nature’s bounty, gobbling up acorns and nuts, and be ready for harvest before the heavy snows of winter. In theory, it all makes perfect sense. But as Chuck reminds me, it’s the small details that sometimes sabotage success, and without superior woodland genetics, the puzzle can quickly fall to pieces. To that end, Bert and Ernie have each been penned with two sows for a month, and today, thirty consecutive date nights have come to an end. Assistants Steve and R.D. coax Bert through a gate with a bucket of grain, into analley where Chuck showers handfuls of cracked corn to keep him distracted. Before long, they’ve loaded the sows onto the low trailer, and Bert is back in his bachelor pad; the same routine goes for Ernie. Minutes later the sows are being trundled to their farrowing area, four rustic A-frame structures where the piglets will be born—by standard gestation, three months, three weeks, and three days from now. Chuck affectionately scratches Bert behind the ear, then glances at his wristwatch. “Whoops. I told Nadine we’d be in for a late breakfast, not late for breakfast.” We head uphill to the cabin, where the warm smell of biscuits and bacon greets us at the front door. Inside, Nadine has prepared a platter of crisp bacon and a pan of steaming biscuits, placed beside a jar of homemade blueberry jam. We sit down to a midmorning feast of savory pork and sweet, buttery biscuits, washing it all down with a cup of strong black coffee. They’ve been partners ever since. 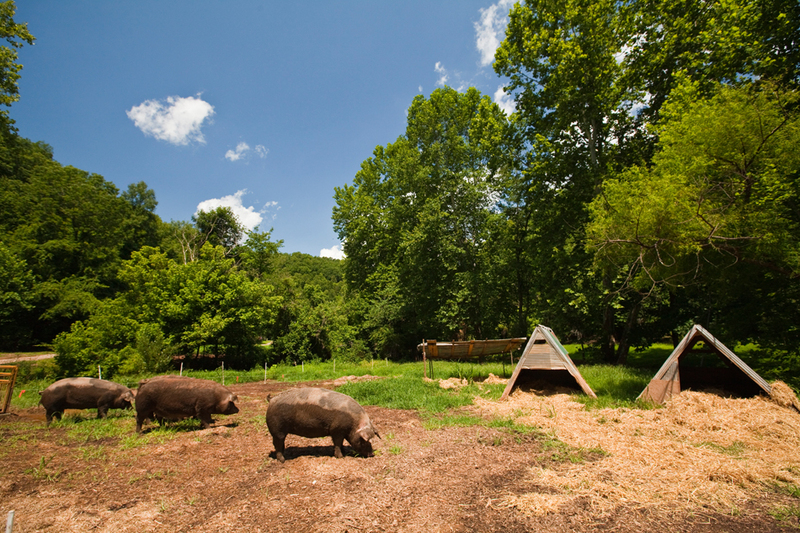 For ten years the couple has worked to create the ultimate acorn-finished pig, turning the fat of the land into the fat on the ham, an artisanal alchemy prized by chefs worldwide. It’s the fat, after all, that’s key to beautiful pork—a thick rind not only ensures flavor but also locks in moisture during the two-year curing process. Nadine and Chuck work with a partner to sell their hams to restaurants, slowly expanding as more chefs rave about their products. Chuck ceremoniously rises from the table, unfurling a white cloth. There, held aloft in a wooden vise, is a solitary, prized, acorn-finished ham. It might be my imagination, but in the distance I suddenly hear a celestial choir ringing through the wooded hills. In three deft slices the meat is plated, transparently thin and curled at the edges like a pink rose petal. Exquisitely salty and profoundly rich, the pork melts on my tongue like communion bread, palpable for an instant, then gone forever. My taste buds are delighted, craving more. I finish the slices with a balancing bite of biscuit, savoring the woody traces of walnut and hickory. Grazed on hand-sown grain, finished on autumn acorns, Chuck might have invented a culinary fusion all his own: Spanish Allegheny. An ocean apart, perhaps, yet tantalizingly similar. After breakfast, we climb the rough road that transects the farm, ducking beneath the supple limbs of pawpaw and hemlock, wild apples inherited from lost homesteads. Here, where the trail is too steep for work boots and the laurel too dense to pass, hogs will be loosed in a month’s time, foraging for sustenance, a distant perimeter fence their only impediment. We stand wordlessly, surveying our circumference. The land here is old, sacrosanct, silent in the dappled shade of summer. A thousand acorns born into a thousand oaks, time surpassing all understanding. Light bends everywhere— untenable, wild. A farm like Black Oak Holler is tamed only where clashing mountaintops intersect with startling blue sky. Excerpt from Growing Tomorrow: A Farm-to-Table Journey in Photos and Recipes, copyright © Forrest Pritchard, 2015. Reprinted by permission of the publisher, The Experiment. Available wherever books are sold. I’m looking forward to reading this book. Thanks for the excerpt. 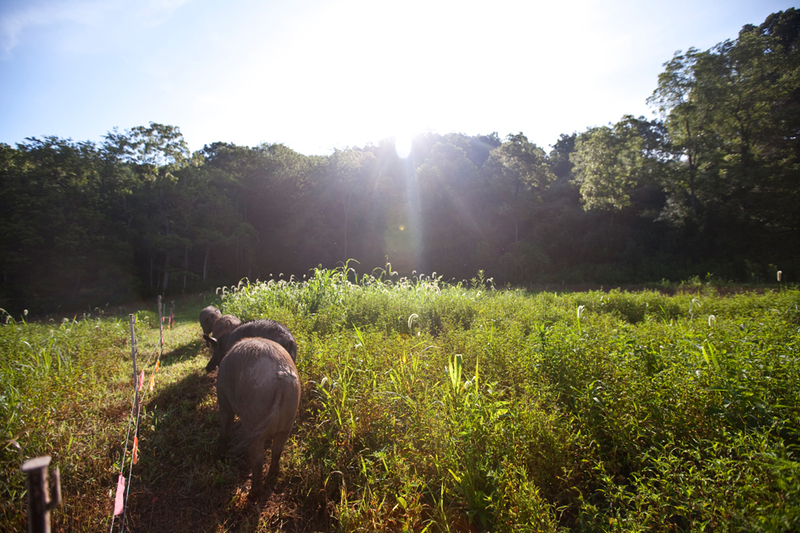 Our pigs are foraging for acorns these days too, although we still supplement with a GMO-free feed. I’m curious whether Chuck is supplementing with feed too. Maybe the book will answer the question.